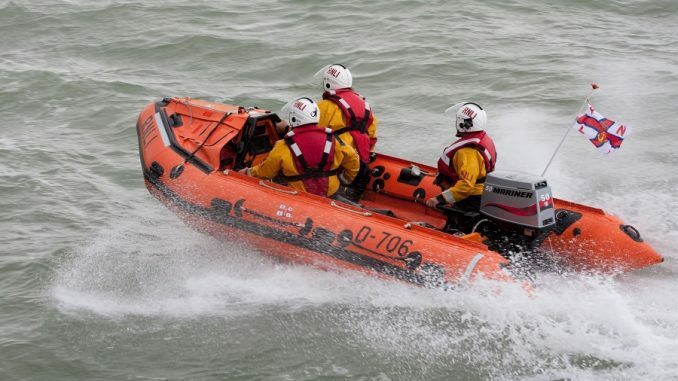 Margate’s RNLI inshore lifeboat rescued a man and his 11-year old daughter after they were cut off by the tide at Kingsgate today (February 3). UK Coastguard received a call around lunchtime reporting two people cut off by the tide below the Captain Digby pub. Margate’s volunteer RNLI lifeboat crew were paged and the inshore lifeboat was launched to assist just 10 minutes after the initial call. Margate’s Coastguard Rescue Team was also tasked. Once on the scene the lifeboat found a man and his 11-year old daughter on the beach, both were wet and showing signs of the onset of hypothermia. The father had gone into the sea with his daughter on his shoulders, spending 20 minutes up to his chest in the water in an attempt to reach safety. Both were taken onboard the lifeboat and transferred back to the lifeboat station. They were checked out by an ambulance technician and after a warm shower and a change of clothing at the station were released into the care of members of their family. Ian Lowe, Deputy Launching Authority, Margate lifeboat said: “The man was well prepared being familiar with the area and taking the precaution of checking the tide times, but made an error with the timings, the tides are especially high this weekend. Margate RNLI publishes tide times for the weekend on its facebook page each Friday morning.